A fun family card game - match the number or colour last played with the cards in your hand, reverse the direction or change the colour.... if you can! It all depends on which cards you've got and which cards your opponents hold. If you can't play a card, then you have to pick up some cards. 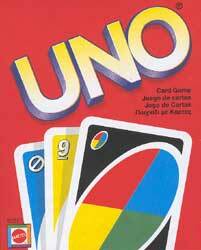 Don't forget to shout 'Uno' when you are left holding 1 card!